Geordi is left behind (but not Kirk Cameron-style) on a particularly nasty planet near the Neutral Zone after the Enterprise responds to a distress signal. Riker and Worf take a survivor from a crashed Romulan shuttle back to the ship while Geordi must try to find a way to escape and survive. He encounters another Romulan survivor (John Snyder) and must convince him to help in the escape attempt despite two centuries of hostilities and prejudices. Meanwhile, Crusher is unable to save the Romulan on the ship after Worf refuses a transfusion that might have saved him. Picard must then deal with a tense standoff with a Romulan warbird and its leader, Commander Tomalak (Andreas Katsulas) who crosses the Neutral Zone. At the last minute — and with the prospect of war hanging in the balance — Geordi is able to signal the Enterprise by modifying a probe sent to the planet by Wesley. With Geordi and the second Romulan saved, the standoff ends, with the warbird returning to its own territory. This is the first in a handful of episodes over the next few seasons in which the Romulans become recurring villains. In the second season, only “Contagion” features actual Romulans — after they returned with much sound and fury in “The Neutral Zone” — and doesn’t set things in motion like this episode does. The idea that a standoff could be another Pearl Harbor — a comment Picard makes — is a major point surrounding the Federation/Romulan dealings over the next few seasons. This episode is the first in TNG where that idea really hits home, which is why it made the tapestry. But “The Enemy” isn’t as good as other upcoming episodes featuring the same topic, notably, “The Defector”, an excellent episode later this season. Tomalak shows up again there and a couple other times, including TNG’s finale “All Good Things … “. Galorndon Core, the planet in this episode, is referenced a handful of times as well. More of Worf’s back story and its effects show up here, too. 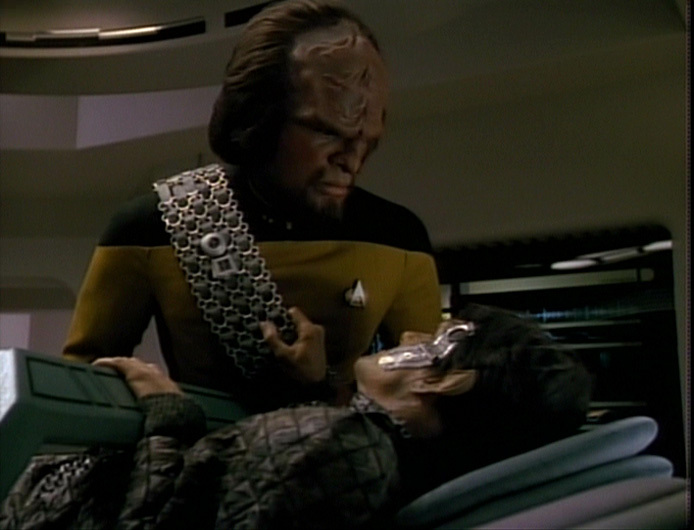 We saw a glimpse of this in “Heart of Glory” and “The Neutral Zone”, but his refusal to give a transfusion to save the Romulan on the ship, the Romulan’s unwillingness to take the transfusion (he says he doesn’t want to pollute his body with “Klingon filth”) and efforts to convince Worf from Crusher, Riker and Picard provide a microcosm for the relationship between the three powers. In fact, the Romulan hatred of Klingons (as opposed to simple disdain) really shows up here for the first time. Insert Harry Mudd joke here. There are some logical issues. 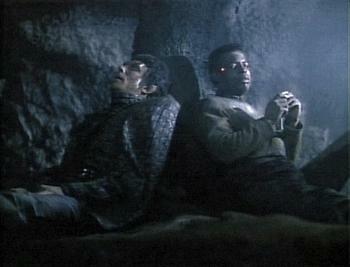 The big point of conflict is that the Enterprise can’t leave the planet to return the first Romulan survivor to the warbird without recovering Geordi. Why didn’t the Enterprise simply leave a (well-armed) shuttle in orbit to try to recover Geordi — or perhaps leave the saucer section? The Enterprise could have taken the survivor into the Neutral Zone and avoided the entire standoff. Sure, there are some reasons why that could be problematic. Maybe leaving a shuttle or the saucer section undefended at the planet (where a cloaked ship might appear and open fire) wouldn’t be ideal. But the idea isn’t even suggested. And keep in mind that the Enterprise (until the end of the episode) doesn’t know there’s another Romulan survivor. It’s also somewhat odd that the storms on the planet affect some electrical systems, but not others. Geordi’s VISOR, his tricorder, his phaser and the Romulan’s disruptor all seem to work OK. But early dialog indicates that the storms should cause more problems. Riker says Data would be seriously messed up by the storms. Something happens in this episode that really should have happened throughout the first two seasons. Wesley comes up with a good idea that ultimately saves the day — and it’s not annoying to watch! It’s further evidence that TNG really got its sea legs in the third season and that the biggest problem with Wesley early on was the execution. Having a boy-wonder type wasn’t inherently flawed. This episode also allows LeVar Burton to shine away from his usual glut of technobabble. Geordi’s an interesting character in that he’s much more down-to-Earth (down-to-galaxy?) than the other characters on the show, with the possible exception of Crusher. That’s not to say this episode wouldn’t have worked with Picard or Riker stuck on the planet. But putting Geordi in the role was a good choice. His discussions with the Romulan on the planet work quite well.